We were up and out by 8:00 and water conditions were great. Joe and I stopped at the Brule River at snack time and it’s really a busy area. We also fit in a 10 minute nap, we love that part! Paddled back out and aimed for the Amnicon River. The water was really churned up from the storm and it was brown, not pretty at all. Made our goal and landed at Amnicon, all set for our crossing. Had a fellow here taking photos of the sunset, also took pictures of our tent and the setting sun. We talked a bit about our trip. Our day started with a visit from the man taking pictures last night. He likes what we are doing and says it’s inspirational, he plans to do a story on us. Come to find out, it was Senator Bob Jauch, had a great visit and he’s a really nice guy. By 7:00 we were heading out for a 14 mile crossing, this allowed us to avoid the very busy Harbor in Duluth. It also set us up for McQuade Small Craft Harbor and an interview with a news crew from Duluth. 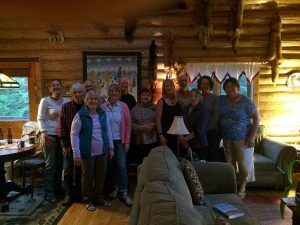 We talked with them for quite a while then headed back out on our way to Two Harbors where we got a spot at the campground and settled in. Our friend Ramona stopped to say Hi and gave us a lift to the store to buy snacks, we can’t live without our Snickers. Joe’s long time friend Binner also stopped by. She picked us up and took us into town for dinner at the Vanilla Bean, it was delicious. She is great company, we had a really good time. We had a slow start this morning, it was raining when the alarm went off. The tent was a wet mess when we packed it away…again. We got on the water at 8:00 and it was perfectly calm. It was sprinkling but with calm water, we had nothing to complain about. 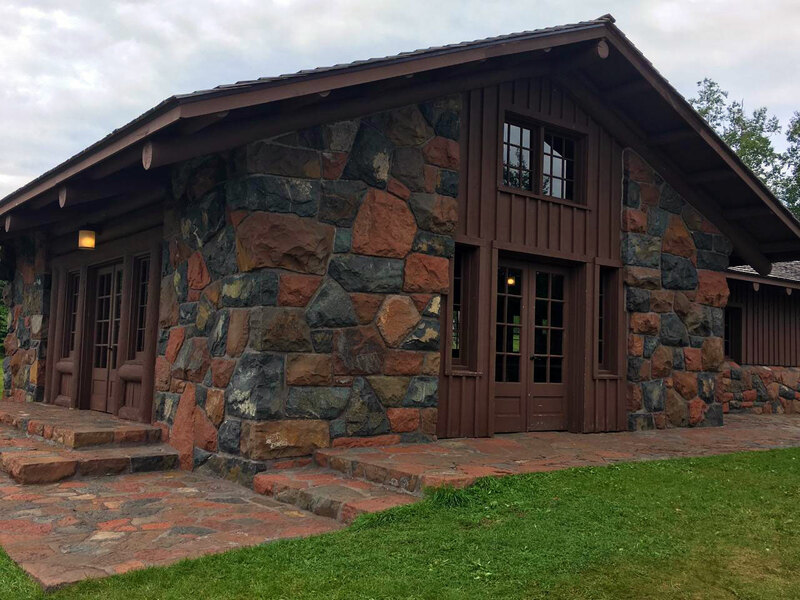 We stopped for our rest at a Civilian Conservation Corps (CCC) camp on the Gooseberry River, I think it said it was built in 1935. The workmanship on this structure is excellent! The rock and log work is gorgeous, it’s worth the stop just to see this building. It also has beautiful shoreline to walk and enjoy. 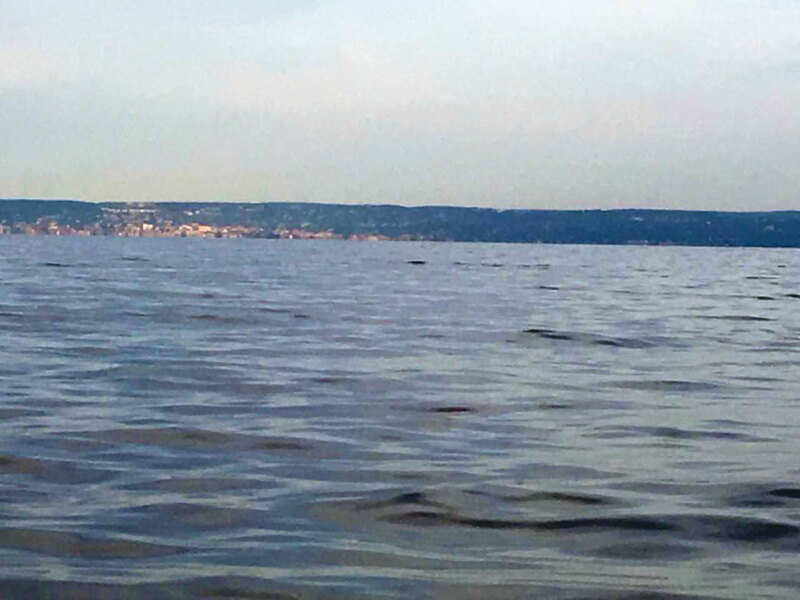 This stretch also took us past the Split Rock Lighthouse, it’s just as pretty and impressive from the water. 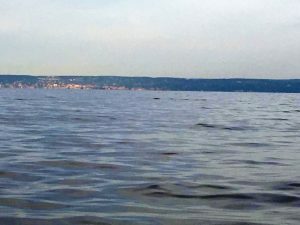 As we paddled past we also encountered several other kayaker’s one of them must have been 2 miles out and still heading out, no idea where he was going…nothing there. Lots of folks were enjoying the tour of the lighthouse and we had a lot of them waving to us, it’s just fun to be part of it all. 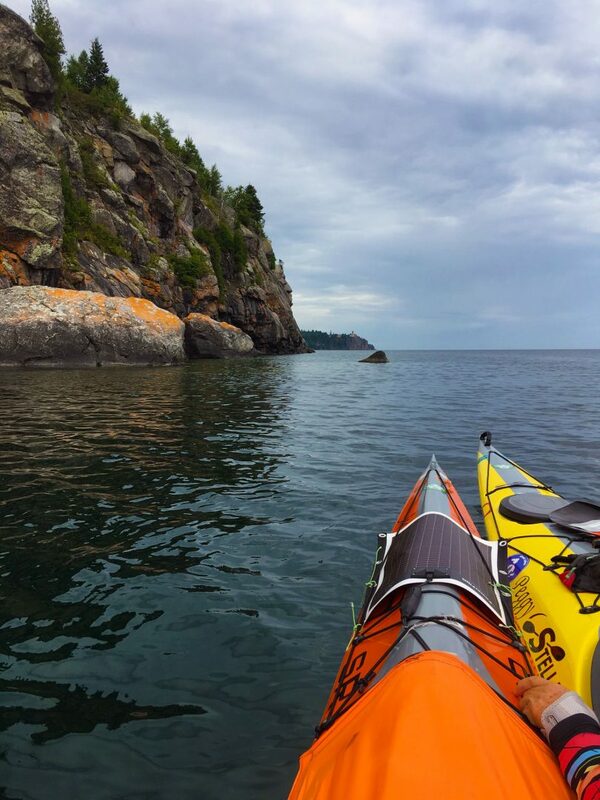 We ended our day at the Tettegouche State Park at one of the Lake Superior Water Trail sites. It was recommended to us by a friend and she was right, it had an amazing view! We paddled 31 miles today. Breakfast was finished and we were packed up and out by 7:00, we were treated to calm waters again. Very few boats on the water today, surprising with how nice it was. We passed a lot of rock walls on this stretch and we didn’t have many opportunities to pull off but eventually we needed to stand up so we pulled into a beautiful rocky area but with the water flat we were able to leave the boats on the rocks without any danger of harming them or having them take off without us. Lots of pretty and interesting rocks on this shore and I did manage to sneak a few more into my boat. 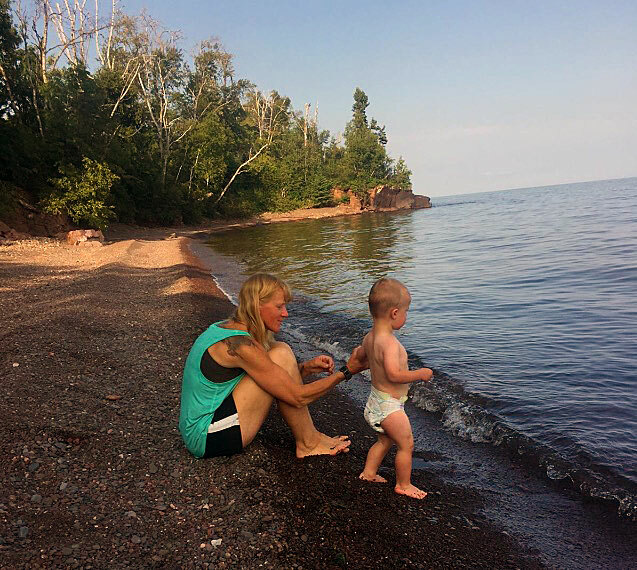 We hit the water again because we had a date today, Dustin, Kelly and Brock were meeting us in Tofte! 🙂 talk about motivation! Joe was familiar with the area so he had a little adventure planned for me, we paddled through a small cave and it was so fun. The Lake was picking up a bit on the last part of the day, not uncommon but also not a big problem. We reached our destination by 2:00 with a total of 29 miles for the day. Our company arrived at 4:30 and it was so nice! I miss my babies and they are changing so much while I’m gone. They grow so fast, even faster when you don’t see them as often as normal. 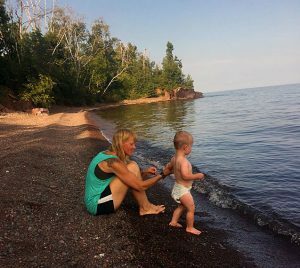 We played on the beach and Brock is one tough little guy, he is just 1 1/2 and he played in that water for a long time, Lake Superior is not warm! The kids treated us to a great meal at Papa Charlie’s Saloon & Grill in Lutsen, Minnesota. The food was excellent and the company was even better! They even stopped at Betty’s Pies and got treats for us, it was so good! When it was time for them to leave it was another hard good-bye. The forecast for today was not good so we made arrangements to be picked up and taken to Joe’s house in Grand Marais. It was so nice to be home and we had a great afternoon enjoying the normal life. We picked berries, went grocery shopping, did laundry and just relaxed. Joe cooked supper for us, nothing dehydrated, not that we don’t eat well when we are camping…we do but it’s just nice to have something different. We slept in a real bed…Home Sweet Home! Still home, a windy and rainy day and the Lake is wild. Small craft warnings and even the bigger boats are staying in the Harbor. 2 Paddling 5 had an appointment with a reporter in Grand Marais, it was a nice visit and should be a good story in the paper. 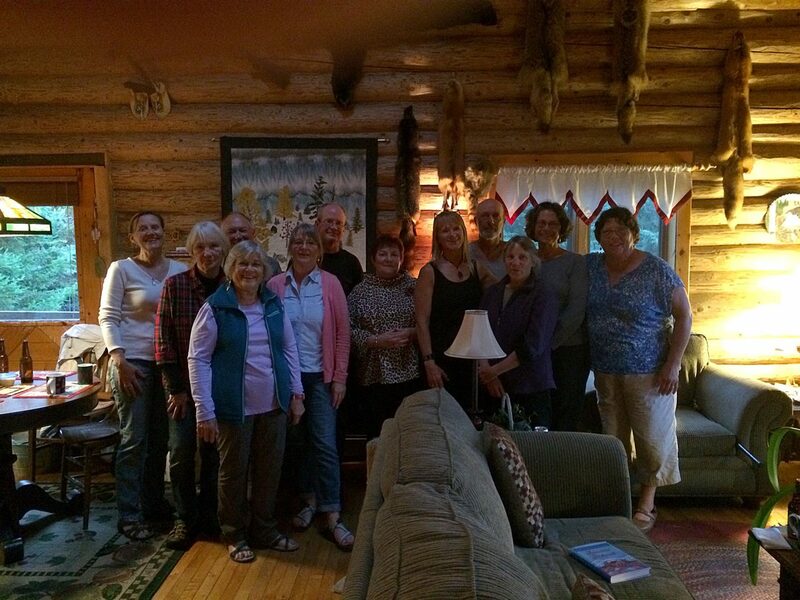 Joe and I had a gathering of friends from the Paddling Club at the house. We had several show up and everyone brought something tasty to share, potluck is the best! It was an evening filled with stories and laughter, so nice to be around friends again. I miss the domestic side so much it was even fun to clean up after everyone left. 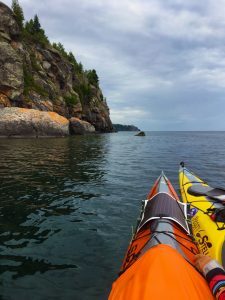 We took today off also to give the Lake time to relax and just because it feels good to let out bodies rest and recover from the strict schedule of paddling we have been keeping up with. We did a few minor fixes on our boats and re-packed our supplies. Some things we don’t need are being left behind and some things we think could be helpful are being added.